When I worked in marketing for the law firm many moons ago, one of the things I least liked was hiking across various cities encumbered with display equipment. I can still hear the clack clack of my heels across pavements or through bleak and deserted shopping malls in the early morning, as I lugged trolleys stuffed with brochures or sweated buckets pulling along exhibition stands and, of course, laptops and projectors. Glamorous it was not. And it was certainly stressful wondering if everything would connect, switch on and if Powerpoint would behave. How different things would have been had I had this rather nifty and compact home projector from Epson. It’s light, portable, easy to use, comes with a remote and is a breeze to set up. And I speak as someone who is not tech-savvy in the slightest. In fact, the kids have given up asking me to switch on the Xbox or even Netflix because we seem to have 72 different passwords and everything is connected to everything else in a way that only my techie husband could configure. (And yes, he has uttered the words “switch it off and switch it back on again). 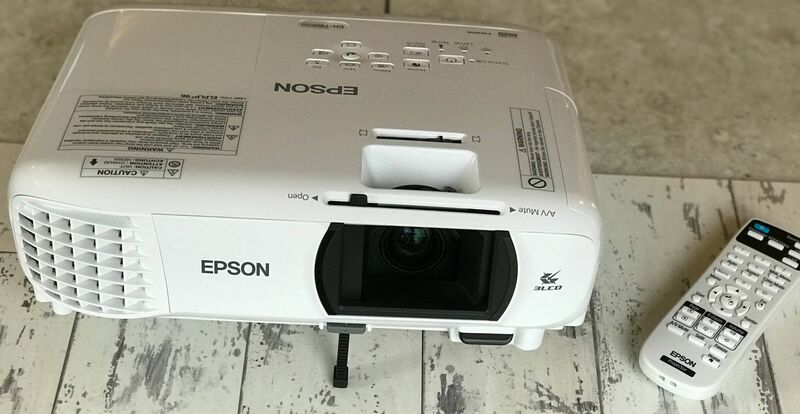 Epson sent us the the Epson TW-650 home cinema projector, the ideal projector for creating a cinema experience from the comfort of your own home. 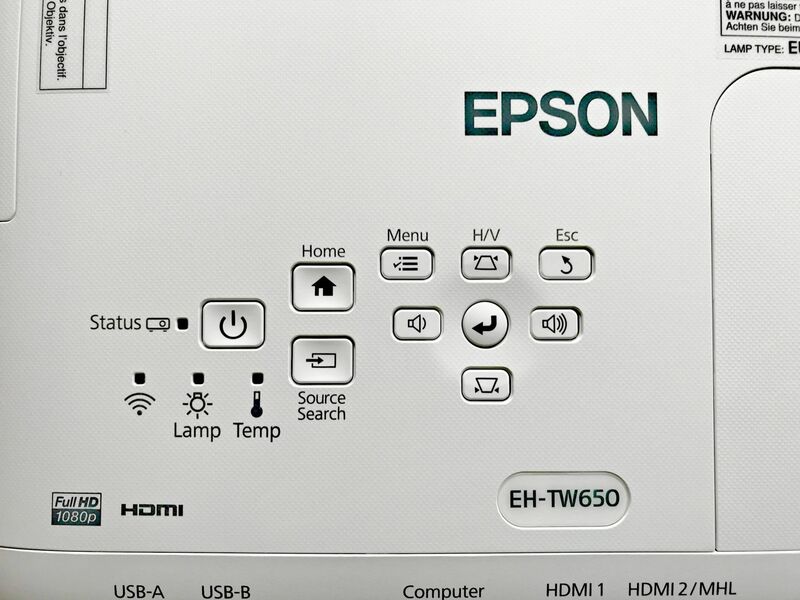 We have previously reviewed the Epson ET-2500 Ecotank Printer so were expecting good things from the TW650 from both a design and a technological standpoint. Given that it is rugby Six Nations time, the husband was only too happy to watch Wales v Italy last Saturday in glorious technicolour on our white lounge wall. The husband uses the exact same model in his London office but whilst it’s great for presentations, it’s also great for supersizing your family’s TV and gaming if you have a plain wall to project on to or, of course a screen. Instead of casting a dark shadow over your living room in the way that a giant plasma inevitably will, this projected display will disappear at the mere touch of a button, so you have more space and less clutter. It has 3LCD technology that can create a 300-inch display, and a long lamp life providing up to 11 years’ worth of entertainment. Focusing the projector is simple and is done by a sliding mechanism on the front of the machine. You’ll also find an easy to navigate control panel in addition to the remote which is clearly marked. Epson’s 3LCD technology delivers a clear image that doesn’t have the ‘rainbow effect’ you get with some 1-chip DLP projectors. It produces a high White and Colour Light Output of 3,100 lumens and the full HD 1080p projector delivers exceptionally bright yet colourful images with clear details even in bright rooms. The sound quality from the projector’s own speakers is acceptable (it’s what you can hear on the video) but of course you can plug it in to your TV or other tech equipment to boost the sound for the full cinematic experience. It also comes with a handy remote with the battery supplied. Rather than everyone hunched around the TV struggling to see, we were able to stretch out in comfort whilst the husband shouted “knock-on” and “numbers” and other rugby terminology I haven’t got to grips with. (Apparently knock on is to illegally drive the ball with the hand or arm towards the opponents’ goal line). Caitlin and Ieuan loved playing Minecraft on the ‘big screen’ – they play multi-player and sit side by side arguing. Sadly the Epson projector is unable to quell tween-ager bickering! If, like us, you struggle to find babysitters, the TW-650 is a decent substitute for a date night and great for a family movie or gaming night. Since it costs us around £50 for a cinema trip with the kids you can see how the savings from a home cinema will add up! You can also buy accessories such as a soft carry case and a ceiling mount on the Epson website. The Epson Home Projector EH-TW650 retails at £599.99 inc. VAT and it’s compactness, ease of use and crisp projection make it a great addition to your home entertainment equipment. To find your nearest dealer visit the Epson website. If I find this projector easy to use, trust me, anyone else will! *We were sent an Epson Home Projector for the purpose of this review. Hate Your Job? Do These NOW. "Ideal World 18th Birthday Celebrations – Join The Show For Bargains!" Oh this sounds like a fantastic projector. I’ve always wanted to try a home projector for movie nights with the family. I will definitely be checking this projector out! Thank you.